The photodegradation of IPA according to coating conditions was examined by TiO2-coated POF. In the photoactivity of TiO2-coated POF, ethanol solvent was higher activity than other solvents. Inorganic(KR-400), organic(A-9540) and inorganic∙organic hybrid(GPTMS, TMOS) resins were used as binder. Organic binder(A-9540) showed the highest activity for photodegradation of IPA. But organic binder was decomposed by TiO2, inorganic binder had lower binder ability than others, but inorganic binders were lower adhesive than organic binders. The optimum activity obtained when the ratio of TMOS and P-25 was 0.05~1:1. Photocatalysis is attracting a great deal of attention from view points of fundamental science and applications for practical use. The photocatalytic degradation of pollutants using photocatalysis is attracting considerable attention for the application to environmental problems[1-3]. Among the various photocatalytic material, TiO2 has attracted wide interest for its potential use in environmental purification. Recently, Photochemical degradation has been commercially applied to environmental cleaning by utilizing photocatalytic oxidation of volatile organic compounds(VOC) by TiO2 powers or coating[4,5]. This photocatalytic method is based on the reactive properties of electron-hole pairs generated in the semiconductor particles under illumination by light of energy greater than the semiconductor band gap energy. These charge carriers can reach the particle surface and react with species in solution with suitable redox potentials[6,7]. While various research areas on photocatalysis have been studied, the immobilization of photocatalyst on a specific substrate, in particular, has received considerable attention due to the versatility of application. In this study, plastic optical fibers(POF) were considered as light-transmitting media and substrates for the potential use in photocatalytic environmental purification system, comparing with that of quartz optical fibers(QOF). It is concluded that the use of POF is preferred to QOF since the advantages such as ease of handling, lower cost, relatively reasonable light attenuation at the wavelength of near 400nm can be obtained. And also, this system has been identified to achieve two main goals; transfer of light and volumetric reaction among the various immobilized reactor system. In some studies, solid-gas phase heterogeneous photocatalysis using TiO2 has attracted considerable interest for VOC removal, in particular due to the possible use solar radiation, and numerous applications have been proposed. A large variety of organic compounds may be oxidized by TiO2 photocatalysis in the presence of molecular oxygen. For instance, some authors studied in a project on air quality the photocatalyzed oxodation of oxygenated compounds, such as acetone, 1-butanol, butanal, formaldehyde and m-xylene, detected at working places. we have been interest in the photocatalytic degradation of aliphatic compounds bearing an alcohol and we have chosen isopropyl alcohol (IPA) as model compounds. In this paper, we performed deposition of TiO2-coatings on POF, and the effectiveness of photocatalytic degradation of IPA was investigated under several coating conditions. Almost Chemicals were of reagent grade and used without further purification. Ethanol, isopropyl alcohol, tert-butyl alcohol, acetone, 1-octanol from Aldrich; TiO2 from Degussa P-25; Plastic optical fibers(POF), Binder(Aâ-9540, KRâ-400 GPTMS; 3-Glycidoxypropyltrimethoxysilane, TMOS; Tetramethyl orthosilicate) from commercial grade. 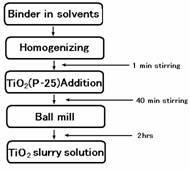 TiO2 slurry was prepared with known amount of TiO2 in selected solvents and stirred before introducing the support. Selected binders and diluting solvents were mixed for 1min at room temperature. This binder mixture was added to TiO2 slurry for 40 min and were performed ball mill for 2hr. Fig. 1 shows the preparation of TiO2-coating slurry solution. Fig. 1. Preparation of TiO2-coating slurry solution. Pretreatment of POF could not be done either thermally or physically because the materials of core and clad is very similar to each other. Solvation using appropriate solvent was finally chosen to remove the clad of POF. After removing the clad from POF with 1mm diameter, the resulted diameter should be closed to 0.98mm(matched with data by supplier). Clear proof of change in diameter of the POF was obtained by SEM(JSM 5900, JEOL) taken at various time scales. The POF were dipped in the slurry solution by hand in an atmosphere. After each coated POF was allowed to dry at 80℃ for 2hr. A schematic representation of the experimental set-up used for performing photocatalytic degradation processes at the solid-gas interface is given in Fig. 2. The whole configuration consists of a light source(Sankyo Denki, 8W, BLB UV lamp, 2EA), pyrex reactor(730ml, cylinder cell type), thermocontroller, Gas chromatography(GC: Young Rin, Column: HP-1, 30m × 0.321mm × 0.25 ㎛, 60℃ to 325℃, Oven Temp. 30℃ , Injector Temp. 150℃, Detector Temp. 200℃), Carrier gas(N2/O2/H2), Detector(FID). The system was covered with aluminum foil which served as light reflector. 3. sampling port; 4. foiled chamber; 5. cooling fan; 6. thermocontroller. The POF of 30cm units was soaked in acetone for 90 sec, pulled it out and washed with distilled water. TiO2 slurry solution consisted of TiO2, binder and ethanol. The weight ratio of TiO2/binder/ethanol was 0.05/1/5.6, respectively. We used several binders such as inorganic binder(KR-400), organic binder(A-9540) and inorganic∙organic hybrid(GPTMS∙TMOS) resins. Furthermore, the ratio of TMOS : TiO2 was from 0.05 to 1. This slurry solution was treated by ball mill at 300 rpm for 2hr. Pretreated POF were dipped into the stirred 15wt% TiO2 slurry solution and then oven-dried at 80℃ for 2hr. TiO2-coated POF were moved to reactor. The inner temperature of reactor was maintained at 25℃. IPA 430ppm was injected in reactor. When thermal and diffusion state is stable. then, UV light source was turned on. Photodegradating sample was transferred to a GC by syringe in 0.5ml scale per few minute intervals. The present study identified the target IPA by retention times using GC/FID analysis. The preliminary processes were examined on the surface of PMMA(polymethyl methacrylate) instead of POF, in order to identify the influence of the amount of TiO2 on the photodegradation of IPA. As seen in Fig. 3, the efficiency of the photodegradation of IPA was proportional to the amount of TiO2(0.01g, 0.02, 0.03g). Fig. 3. The influence of the amount of TiO2(0.01g, 0.02, 0.03g) on the photodegradation of IPA. Fig. 4 shown the effect of the IPA concentrations (215, 430, 1000ppm) using TiO2 0.02g as the previous results. For all three IPA concentrations, the tendency of IPA degradation showed the similar pattern. The photodegradation efficiencies were about 80% for 215ppm at retention time 9.5 min, nearly 100% for 1000ppm at retention time 24min. Fig. 4. The effect of the IPA concentrations (215, 430, 1000ppm) on TiO2 0.02g. Degradation profiles were shown in Fig. 5 with data for several solvents such as ethanol, tert-butyl alcohol, 1-octanol, from low to high-chained alcohols. The photodegradation efficiency was essentially dependent of the diluting solvents used in the coating processes. As shown, Ethanol exhibited higher performance than other solvents, 1-octanol was lower performance. From results, the effect of IPA photodegradation decreased with an increase in the carbon chain number. As the previous results, we have used ethanol as diluting solvent. The dependence of binders on the photodegradation of IPA has been studied using binders such as Inorganic(KR-400), organic(A-9540) and inorganic∙organic hybrid(GPTMS, TMOS) resin. The weight % of TiO2(P-25) contains 15wt%. Fig. 6 shows the results of binders to the same 15wt% P-25 and ethanol on POF. From the figure, photodegadation activities of IPA on POF decreased on the binder GPTMS than other binders. Organic binder(A-9540) showed the highest activity for IPA degradation. It is known that this activities difference decrease with increasing carbon-chain length. This reason is similar well-known original photocatalytic phenomenon, which leads to the breakdown of organics, Deduced other reasons is UV reflection and UV adsorption of binder. Fig. 6. The dependence of binders on 15wt% P-25 and ethanol. Organic binders was decomposed by photocatalyst, inorganic binders were lower adhesive than organic binders. Then, we have adopted the use of inorganic∙organic hybrid(GPTMS, TMOS) resins as binder, ethanol as diluting solvent, 15wt% P-25 as TiO2. The ratio of TMOS to P-25 was 0.05∼0.1. The Comparatively activity of the amount of TMOS can be seen from Fig. 7. Increased amounts of TMOS decreased the activity of TiO2-coated POF. The amount of TMOS was less , the activity was more. As shown in figure, the zero amount of TMOS were the most active. From these results, the least amount of TMOS as binder in the coating conditions on POF was needed to exhibit an effective photodegradation of IPA. Fig. 7. Comparison of IPA photodegradation activities with difference TMOS/P-25= 0; 0.05; 0.1. This study showed that the photodegradation of IPA on POF were examined under TiO2-coating condtions. The photodegradation efficiency of IPA decreased with an increase in the carbon chain number. Ethanol exhibited higher performance than other solvents. Organic binder(A-9540) among inorganic(KR-400), organic(A-9540) and inorganic∙organic hybrid(GPTMS, TMOS) resins as binders showed the highest activity for IPA degradation. we have adopted the use of inorganic∙organic hybrid(GPTMS, TMOS) resins as binder. The ratio of TMOS to P-25 was 0.05∼0.1. Increased amounts of TMOS decreased the activity of TiO2-coated POF. The least amount of TMOS as binder in the coating conditions on POF was needed to exhibit an effective photodegradation of IPA. 1. T. Hisanaga, K. Harada, K. Tanaka, J. Photochem. Photobiol. A: Chem., 54, 113(1990). 2. A. Bouzaza, A. Laplanche, J. Photochem. Photobiol. A: Chem., 150, 207(2002). 3. A. Mills, R. H. Davies, D. Worsley, Chem. Soc. Rev., 417(1993). 4. F. W. Wilkins, D. M. Blake, Chem. Eng. Prog., 90, 41(1994). 6. A. J. Bard, J. Phys. Chem., 86, 172(1982). 7. G. Hodes, M. Gratzel, Nouv. J. Chem., 8, 509(1984). 9. Y. Ohko, A. Fujishima, K. Hashimoto, J. Phys. Chem., B 102, 1724(1998). 10. J. Péral, D. F. Ollis, J. Catal., 136, 554(1992).